Summer for me is officially OVER. I think this was the fastest summer ever! It positively FLEW by...but, I must say, I feel ready to go back. I have my dream assignment (3rd and 4th Gifted/High Achievers...what could be better?) my dream classroom, and I am filled to bursting with ideas I can't wait to use! I'm seeing a lot of positivity in the blog world and on social media...I know a lot of us had a rough year last year, and it seems like we are all ready for a rebound. This Monday is full of meetings for me, but I can't wait to get home and check out everyone else's Made Its...hoping to see some classroom reveals in there for some last-minute inspiration! My Monday Made It this week could be more truthfully called "Monday Mom Made It." My mom loves to help me with school stuff, but unfortunately she was not able to come into my class to help this year. No worries! I had plenty of projects in mind she could work on from home. She did an awesome job! I am terrible at remembering student birthdays. Every year I plan on getting their gifts together before school starts, and every year that task gets pushed off the to-do list in favor of more pressing things. It was a non-negotiable for me to get this done for this school year...so I put Mom on the job! ...and had Mom throw in some confetti, a noise maker, a fun pencil (it's hard to tell in the picture, but the pencil has a fuzzy animal print), and a homework pass (which you can grab for free at the above link to Aimee's post). Fun, simple, and cheap...my kind of project! Best of all, they are all ready to go, I just have to grab them out of the box in my closet when needed! 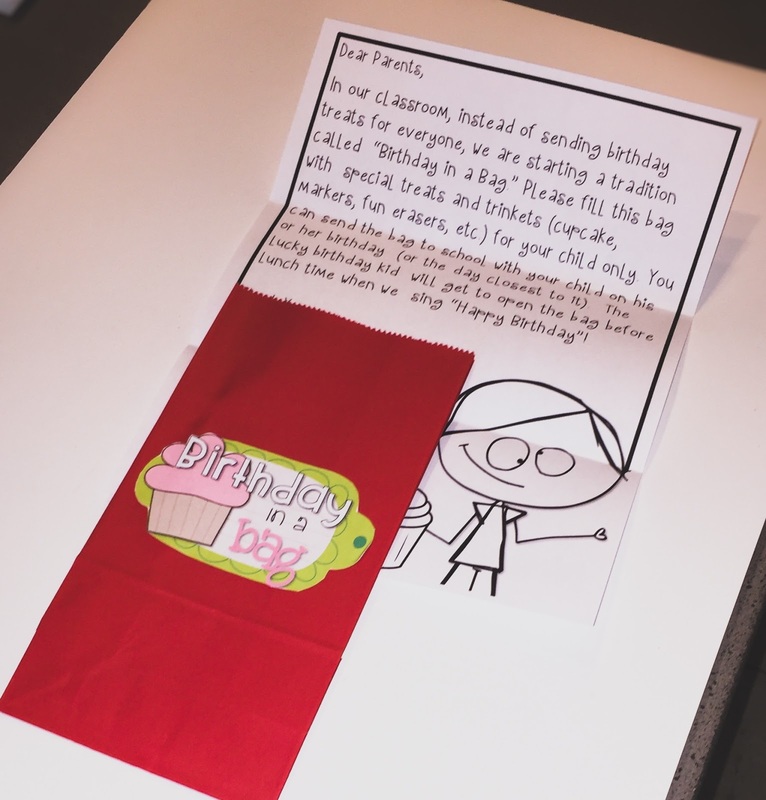 Keeping with the birthday theme, something else I saw on Instagram that I immediately knew I wanted to do was First Grader At Last's Birthday-in-a-Bags. We are transitioning from being a K-8 school to a K-5, which is a GREAT change, however, it does mean we are losing a half hour of instructional time. In addition, we have a schoolwide incentive program that takes place on Friday afternoons twice a month. As much as I love cupcakes, I love getting through my content more, so when I saw this on my feed I immediately went to TpT and downloaded the file (for free)! Instead of the birthday boy or girl bringing in treats for the class, their parents fill up the bag with goodies for just them. The child gets the bag after we sing Happy Birthday. I think this is such a good idea. We get to celebrate the child's birthday AND I don't have to deal with 25 crazed sugar maniacs or wipe icing off every surface imaginable! Win/win! These were easy (for Mom!) to put together. I grabbed some more gift bags, had her stick the label on front (still loving those full page labels!) and place the letter explaining how it works inside the bag. 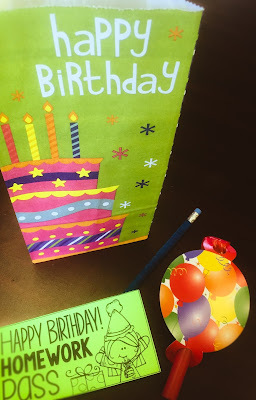 My partner teacher and I will explain Birthday in a Bag during Open House, and then send the bags home at the beginning of each month. I have some extra bags/treats on hand in case someone forgets to send a bag in. Yay, something else crossed off the list! Here's another #instagrammademedoit project that I never would have found time for...again, Mom saves the day! 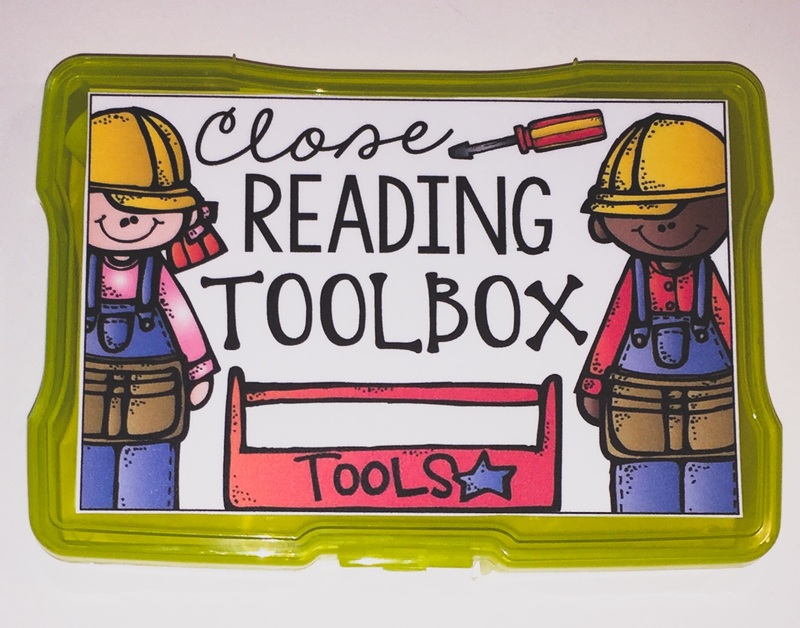 I couldn't resist Create Teach Share's adorable Close Reading Toolboxes. I found the photo boxes on sale at Michael's for 50% off (score!) and all Mom had to do was laminate, cut, and tape the FREEBIE (shout out to all the generous teachers out there!) and they are ready to go! 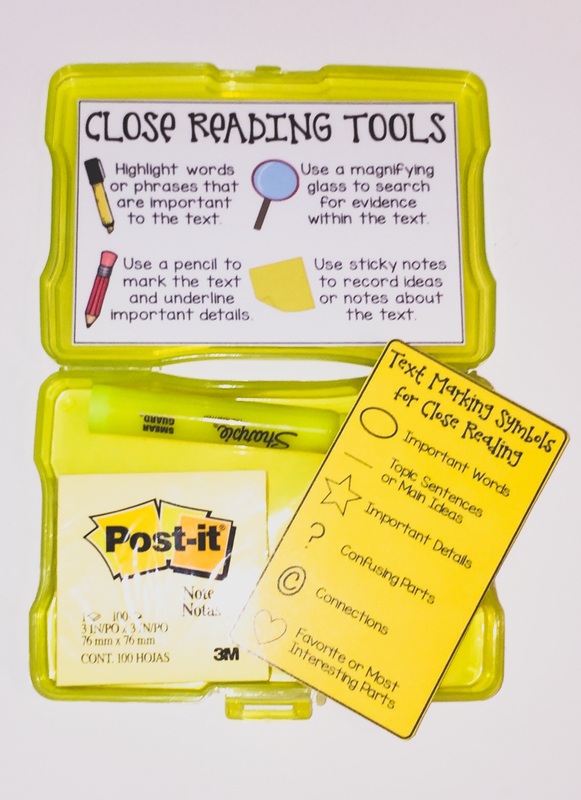 I cannot wait for my students to use these! Moms are the best, right?? I think she deserves a raise...or at least a few dinners out! Make sure to stop by next week to see my classroom reveal, and don't forget to stop by Tara's to see what everyone else is making! Birthdays are always a tricky thing - but of course the kids just love celebrating them. I love the ideas you shared that you plan on implementing in your own classroom. I think preparing as much ‘little stuff’ like birthdays ahead of time is a great thing to remember. The less you can take off your plate the better! 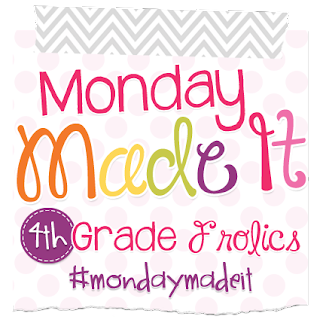 Visiting from the Monday Made It linkup! I agree! I tried to get a lot of the "little things" accomplished during the summer. Thanks for stopping by! YEA for Mom!!! 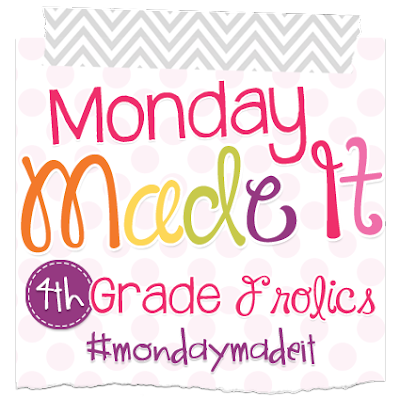 Many thanks for linking up at 4th Grade Frolics Monday Made It!! 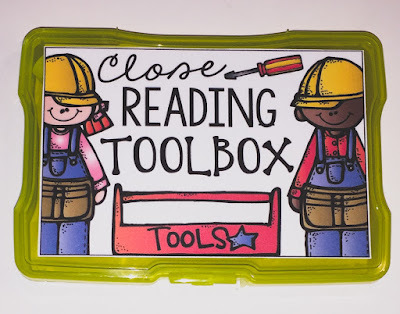 I love the idea of a close read tool box! 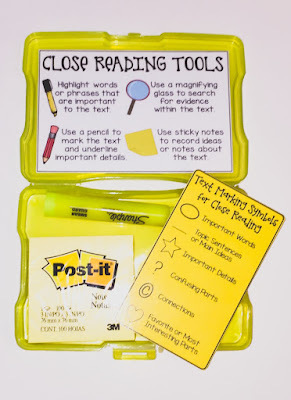 My 6th graders will be doing a lot of close reading this year, so I should definitely look into that!